Digital panels are supplied with a 450A-50mV shunt. Cut out size is 10mm (3/8 inch) inside all external edges. 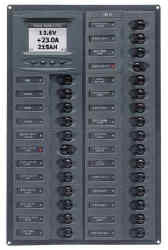 All panels are available in 12 or 24V configuration. If 24V is required please specify at time of ordering.